Agawa Rock is one of the many sights for visitors to the beautiful Lake Superior Provincial Park in Ontario, Canada. With a land mass of about 1,550 square kilometres (600 square miles), Lake Superior Provincial Park stands out as one of the largest provincial parks in Ontario. Located along the northeastern shore of Lake Superior, it is easily accessed by the Trans Canada Highway running through the park and is located within an Eastern-forest boreal transition ecoregion. It is treed by mainly pine, birch and sugar maple and although the coastline is primarily rocky, there are several beaches, one at Agawa Bay campground. In all, there are three campgrounds in Lake Superior Provincial Park with varying degrees of facilities for visitors. Lake Superior and islands seen from Agawa Rock, Agawa Rock Pictographs Trail, Lake Superior Provincial Park, Ontario, Canada. 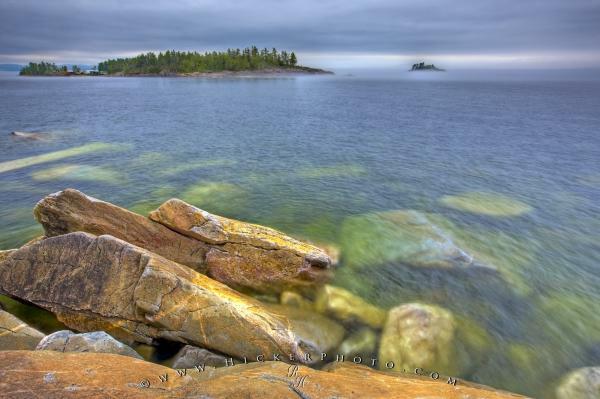 Photo of the coastline of Lake Superior Provincial Park in Ontario, Canada. Pictures from photo gallery "Lake Superior Provincial Park"
This picture is part of the photo album "Lake Superior Provincial Park" - there are more beautiful images waiting for you.